MINING « Global Market Insights, Inc. The profitability landscape of borehole equipment market has been witnessing a massive turnaround of sorts in the recent years, on account of the rising number of mining operations, heavy infrastructural development, and the increased demand for water in drought-ridden areas. In this regard, companies partaking in borehole equipment industry share have been striving to brainstorm rather innovative products and techniques for borehole drilling. For instance, merely a couple of years earlier, Boart Longyear, a rather prominent player in borehole equipment market, was involved in a project that included installing a ventilation shaft for a longwall coal mine in Wyoming. The company deployed a dual-tube flooded reverse-circulation drilling technique that was far advanced than the ones used for a traditional raised bore rig, as it pumped air via the outer tube, forcing mud upward through the inner tube, thereby preventing porous rock from being plugged for the borehole. The same year witnessed Boart launching the game-changing TruProbe drilling system that enables the deployment of gamma, geophysical, survey sensors inside drill strings for identifying any traces of previous metals and minerals at an affordable cost, majorly impacting the product landscape of borehole equipment industry. In retrospect, it would be apt to state that Boart Longyear has indeed established itself as one of leading participants in borehole equipment market, setting ambitious standards for its fellow rivals and new entrants. The CEO of the Vision Development Foundation recently approved a borehole project in Kerr Demba Holley, Upper Niumi, Gambia, for GMD 500,000, that would be powered with solar and storage tanks to deal with the water supply shortage in the district. In a bid to deal with the severe impact of the droughts in KwaZulu-Natal, a funding of nearly ZAR 500,000 has been provided to drill boreholes in communities such as Verulam, Wyebank, Umbumbulu, and Ladysmith. To combat the water scarcity in the region and aid the expansive regional mining industry, companies and governmental organizations plan to make sufficiently huge investments in South Africa, that would eventually impel the regional borehole equipment market share. The National Savings and Credit Bank (NatSave) and the Musika Development Initiative struck a deal in the second quarter of 2017 for implementing a 12-month-long project in the Kalomo district of Zambia, worth ZMW 2 million. The program would apparently entail the sinking of 20 solar-powered boreholes for increasing the productivity of small-scale farmers and improving their access to irrigation solutions in the area. The memorandum of understanding (MoU) for this pilot project is certain to gain ground in the regional borehole equipment market, encouraging other players to follow suit. With extensive developments prevalent in the construction and infrastructure development verticals, it goes without saying that the humongous demand for advanced infrastructural facilities, massive requirement for residential and commercial spaces, in tandem with the regulations enforced with respect to strong building foundations and soil quality would have a profound impact on borehole equipment market size. Furthermore, these products find colossal applications in various grades of mining operations, thus opening up a plethora of new vistas for borehole equipment industry, given the vast expanse of mining exploration activities and the regulations that mandate mine operators to deploy highly advanced machinery for drilling. By and large, it would be apt to state that borehole equipment market trends would undergo dynamic transformations in the ensuing years, contingent on the changing demands of the expansive construction and mining sectors. This entry was posted in HVAC and Construction and tagged Borehole Equipment Market, Borehole Equipment Market Forecast, Borehole Equipment Market Report, Borehole Equipment Market Research, Borehole Equipment Market share, Borehole Equipment Market Size, Borehole Equipment Market Trends, Fixed Borehole Equipment, Hydraulic Operations, Infrastructure, MINING, Pneumatic Operations, Portable Borehole Equipment. 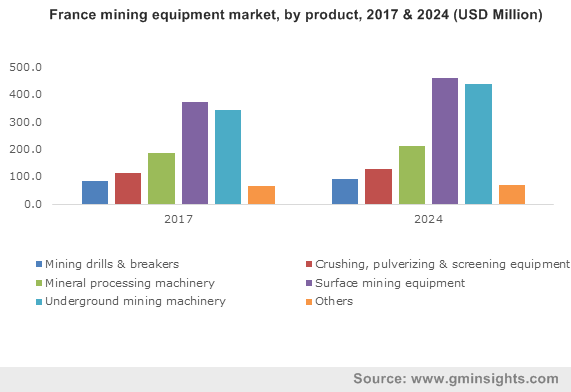 Prominent mining equipment market players have lately been looking forward to developing multi-tasking, durable, fuel-efficient mining machinery for lowering operating costs, reducing service time, and improving mine quality. Currently, various underground specialist mining equipment including diggers, loaders, and trucks are used extensively to excavate metals. However, mining activities across the globe, in the last few years, have increased remarkably owing to the surging involvement of companies in advanced exploration programs. The excavation of a large amount of underground materials has led to a rise in air pollution which has become one of the major causes of the upsurge in the prevalence of respiratory diseases. Taking into account the surging need to curb the air pollution, mining equipment manufacturers have been thus investing in the development of cleaner and safer mining machinery, which has led to most of the companies establishing partnerships to come up with advanced versions of mining equipment. Recently, the International Council on Mining and Metals revealed a plan to make mining vehicles safer and cleaner at the International Mining and Resources Conference held in Melbourne. At the conference, numerous renowned truck and mining equipment suppliers came together to accelerate the invention of next-gen mining equipment. In addition, the Innovation for Cleaner Safer Vehicles (ICSV) is also planning to launch GHG emission-free surface mining vehicles by the end of 2040. The increasing concerns about the depleting fossil fuel resources along with growing importance of emission-free vehicles are thus poised to observe a positive impact on the mining equipment market share. In line with the ambitious clean vehicle development programs, in October 2018, Hitachi Construction Machinery signed an agreement with KTEG Kiesel Technologie Entwicklung GmbH to develop electric construction machinery. With this strategic agreement, it also looking forward to expanding its business across European countries owing to the deployment of strict regulatory norms for curbing GHG emission across Europe. KTEG will help Hitachi to commercialize electric construction equipment in the Europe mining equipment market. Aided by years of intense experience in the development of electric machinery, Hitachi is aiming to decrease life cycle costs of equipment and the burden they pose on the environment. The shifting focus of equipment manufacturers toward the development of highly innovative and fuel-efficient products is likely to proliferate the mining equipment industry size over the years ahead. Over the last few years, in order to deal with the increasing number of mining activities, most of the countries have been planning to procure advanced mining equipment. The initiatives taken by the regulatory bodies have opened up new business opportunities for mining equipment industry players. Validating the aforementioned fact, in July 2018, Coal India Ltd has unveiled its plan to procure mining equipment of worth USD 2 billion over the coming three years. With the procurement of numerous mining equipment, it is looking forward to meeting the growing demand for coal in India. Coal India has also set an aim to produce 630 million tons of coal in 2018-19 and one billion tones in the coming years. Similar to Coal India, the Zimbabwe Consolidated Diamond Company also has invested USD 100 million in the design and installation of complementary mining equipment. With the deployment of advanced equipment, the Zimbabwean diamond company aims to produce the best quality diamonds across the globe. In order to increase FDIs and contribute to strengthen the country’s economy, most of the diamond-producing companies have been investing heavily in the mining sector. The surging participation of the regional governments in the development of the mining industry for the betterment of economy will have a positive influence on mining equipment market size from metal mining applications. The collaborative approach of mining companies and regulatory bodies to accelerate the number of mining activities will have a significant influence on the mining equipment industry growth. With the deployment of ambitious product development programs, global mining equipment industry is likely to traverse alongside a positive growth path. Driven by the growing investments in the mining and metal exploration activities, mining equipment market size will surpass USD 95 billion by the end of 2024. This entry was posted in ENERGY, MINING, OIL AND GAS and tagged Canada Mining Equipment Market, Crushing, Equipment, Europe Mining Equipment Market, Heavy Equipment, Mineral Processing Machinery, MINING, Mining Drills & Breakers, Mining Equipment, Mining Equipment industry, Mining Equipment industry analysis, Mining Equipment Market, Mining Equipment Market 2018, Mining Equipment Market 2024, Mining Equipment Market Analysis, Mining Equipment Market Data, Mining Equipment Market forecast, Mining Equipment Market Growth, Mining Equipment Market Outlook, Mining Equipment Market PDF, Mining Equipment Market Price, Mining Equipment Market Report, Mining Equipment Market Share, Mining Equipment Market Size, Mining Equipment Market trends, Mining Equipment Market USA, Pulverizing & Screening Equipment, Surface Mining Equipment, U.S. Mining Equipment Market, Underground Mining Machinery.